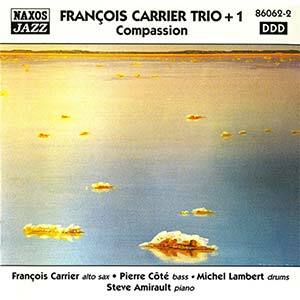 Compassion with Carrier, Lambert, Côté and guest Steve Amirault. Canadian alto sax player François Carrier has pulled together a very talented group of musicians to transform poetry in a global context into music. This CD bears an inescapable constancy of texture.I appreciate every approach to the idea of the expression of Compassion on this recording, especially, the title cut which introduces the seven remaining ventures into the improvisatory / compositional exploration of the CD’s concept. I also appreciate the fact that Carrier has maintained a certain integrity about the focus – he does not become distracted.Noticeable in the first cut is its remarkable similarity to Coltrane but on an alto: there is a slow statement of the main theme and key changes, intense vibratos, extended arpeggiations, and a sound that comes through the alto that is very much like a tenor would make. I see this as taking away from the piece rather than enriching it. Lambert on drums even makes bridges from one rhythm to another using heavy sticks on the toms and corresponding bass thumping like Jones used to do in Coltrane’s quartet; the piano lands chords at the same time as the drums sound. This is not unlike Tyner’s chordal correspondence with Jones that lends a heavy impact to the predominant pitches. There is a switch in timbre through the playing of the bass and piano that continues until Carrier reintroduces the tune, which is quite beautiful, and which he wrote.The last cut is the only one that does not begin with the horn. There is a quick pace laid out on the snare and cymbals. The nature of the recording is conservative. And that is perhaps the intention of the musicians. This third release from the Quebec-based Carrier trio explores the rich vein of possibilities first tapped as hard bop came of age in the 1960s and began to move towards a freer conception. With passionate, uncompromising musicianship, Carrier and company probe these seams between bop structures and the avant-garde to discover fresh improvisational terrain. Carrier’s playing evokes the snaking, vocal quality of Eric Dolphy, the idiosyncratic logic of Ornette Coleman, and the acerbic, outward bound post-bop of Jackie McLean, in a style that focuses on the sound, not on gratuitous, note-filled flurries. In drummer Michel Lambert and bassist Pierre Côté, Carrier has ideal allies. The supple, staccato rhythms of Billy Higgins, the pulse and intensity of Elvin Jones, and the driving cymbal work of Tony Williams all find personal expression in Lambert’s committed playing. Côté, a monstrous talent, is in audible communion with his instrument – its wood, the finish, the strings, the flesh of his hands, and his glorious tone propelling the others to riskier terrain, supporting them and, then, guiding them back. The questing musical spirit evident here has roots in the high-energy and advanced interplay of the Elvin Jones/Jimmy Garrison/Joe Farrell power trio heard on Jones’ Blue Note recordings The Ultimate and Puttin’ it Together. When pianist Steve Amirault joins in, as he does seamlessly for explorations on three tracks, the most obvious reference point is the John Coltrane quartet of the Impulse years, especially on the title track, which calls to mind “Spiritual” from Live at the Village Vanguard. This is music that deserves to be heard by anyone who enjoys the open-ended possibilities – far from exhausted – of the ’60s-era Blue Note and Impulse releases that embraced the avant-garde, but still kept one foot planted in a more structured discipline.